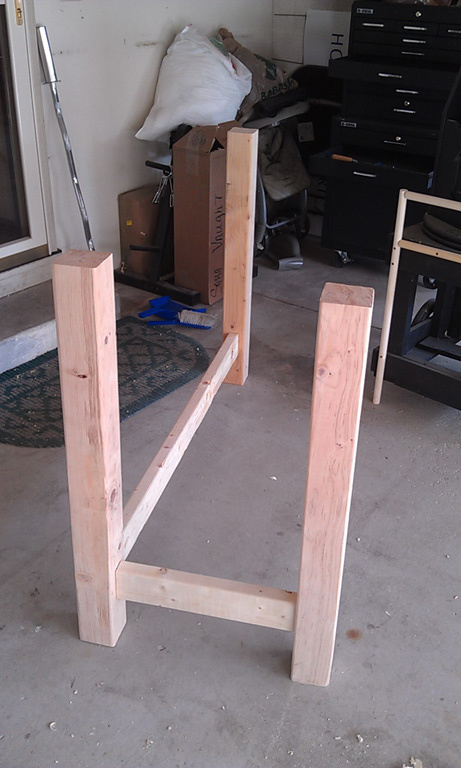 ← Workbench Day 11: Mortises, Tenons, Sharpening oh my! Workbench Day 12: More mortises. Nothing special today, just more working on chopping mortises and 3 more tenons…lots of sawing. Lots. But I have to say I’m seeing a little improvement in my abilities to feel when the wood is telling me I’m going to fast or off angle on the saw strokes. It’s getting easier to saw too—I’m not putting near as much pressure as I did on the first cut of this project. It feels like I’m hardly pushing the saw at all sometimes, but that’s precisely when it cuts the fastest. Crazy. On the upside, I have 3 legs connected by tennons now! Every joint is getting sharper and tighter. I completed 3 joints today in the time it took me to fit the first one! I noticed some twist in the short tenon and I’m trying to decide if the top will straighten everuthing out (with it’s own half blind mortises connected to the legs) or if I should add 2 more short stretchers up high on the legs. I will ultimately have to wait and see what she looks like when I get the last leg and final two stretchers hooked up for the dry fit dress rehearsal. My gut tells me the top will be plenty solid enough to stabilize everything—and the extra tension between the legs may actually help rather than hurt the overall strength of the bench. Am I way off base on this or am I just getting a case of the halfway self-doubts? This entry was posted in Woodworking Skills, Workbench and tagged chisel, mortise, tenon, workbench. Bookmark the permalink. 2 Responses to Workbench Day 12: More mortises. Depends on how you are planning on attaching the top. A skirt will seriously put a stop to racking. If you have a questionable stretcher, wouldn’t you want to replace it before committing to it? Don’t get hung up on the time you spent making the tenons.The next ones will be faster and better. If you want to use some of these from the front, then you need to plan for it by the placement of the legs relative to the top. The stretcher in question is just slightly out of wack…and that’s the thing, I can’t tell how. When I pull the stretcher out of the dry fitted legs, it looks fine. When I put it in one leg, it looks find. When I add the second leg, the whole thing is suddenly off. The screwy thing is, it doesn’t matter which leg is attatched first—it’s only when the two legs are attached that they don’t run paralell to each other. And I’m not talking horrible twist here. I guess I should have said I was just surprised that with the joints fitting as well as they did, I expected the legs to be perfectly paralell, instead of slightly off. I was rushed at the end of the day yesterday right after I did the test fit so I will have to take a second harder look at it this afternoon. As far as clamping, my original plan was just nothing…then, I got sucked into reading just about evertything I could about benches at Lumberjocks…now I’m giong to attempt to make my own leg vise. I’ve seen a few examples out there that use carriage bolts and common hardware from big box stores that fits my shoestring budget. Later when money is more ready at hand, I’ll upgrade to something better. Those holdfasts are definitely on my list! Dog holes for dogs and bench appliances are also on the to do list, with everything likely being homemade at first. Yeah, I got a lot crammed into this first bench! If nothing else it’s going to be a wild learning adventure one way or the other. Thanks for your suggestions and for sticking with me so far! Your advice and reminders have been extremely helpful!